What can you do to beat the competition? Examine every detail about what they do, then find ways to do it better. For example, you can spend dozens of hours researching and compiling a list of targeted keywords that you want to rank for. Or simply look at the keywords that have already been selected and used by your competitor. Moreover, you can select the competitors keywords that have lower rankings and develop a promotional campaign with those keywords, knowing ahead of the time that you will beat your rivals. Data is your main weapon; make sure you use it wisely. Go to the SE Ranking Competitor SEO/PPC Research, enter your competitor’s domain (for example, ikea.com), choose the database (UK) and click “Analyse”. 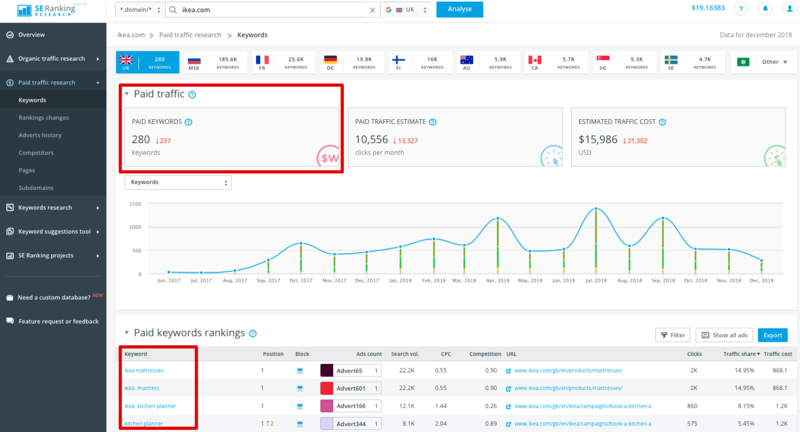 Click on Paid traffic research, then the Keywords, and you will get a full list of the paid keywords as well as their analysis (position, ads count, search volume, CPC and competition). Check your competitors’ traffic cost assessment and use it to plan your own budget. Simply export the list to use it for your own advertising campaigns, or add it to your own findings. Use the data and beat your competitors. If you come up with an idea for your ad, first check ads visuals of your competitors and analyze their effectiveness. Look through their most “clickable” ones and enhance yours. 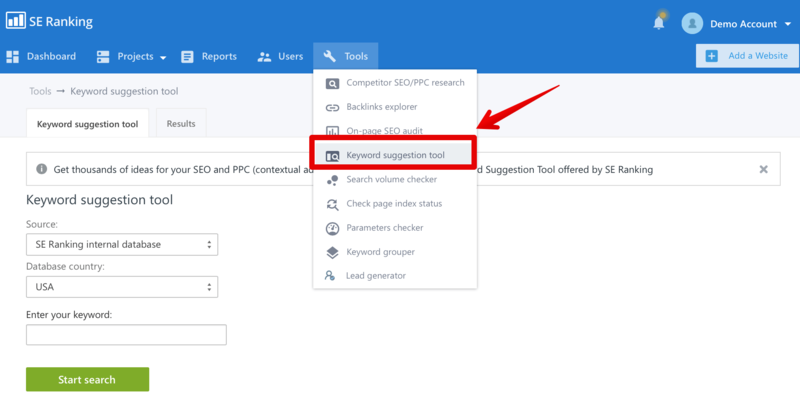 Switch to the Paid keywords rankings, then Adverts in the Competitor SEO/PPC Research module, and click on the ad you’re interested in (highlighted with different colors) to see its headline and text. You’ve optimized the webpage to generate a paid traffic. At the same time, a marketing manager or a client decided to change the content on this webpage for a more “attractive” one with no word to you. At best, your PPC-campaign will be less productive than it was expected and at worst – the budget will be wasted. Check Page changes monitoring. 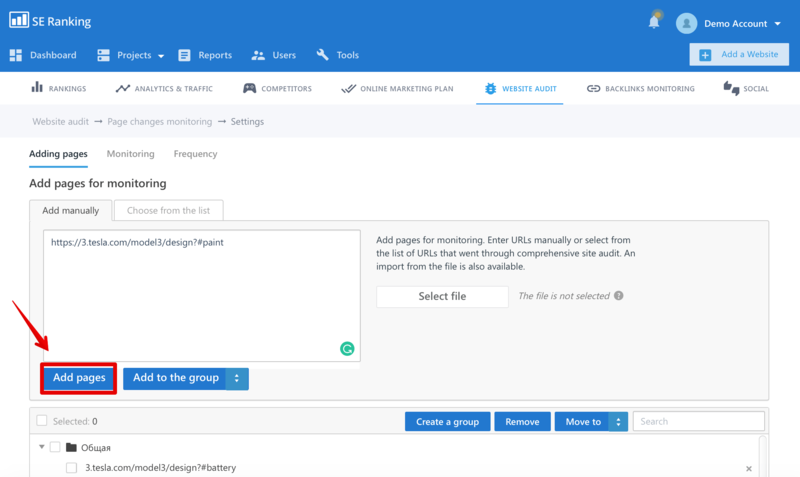 Choose the tool from the drop-down menu at the top of the project page or in the Website Analysis section. 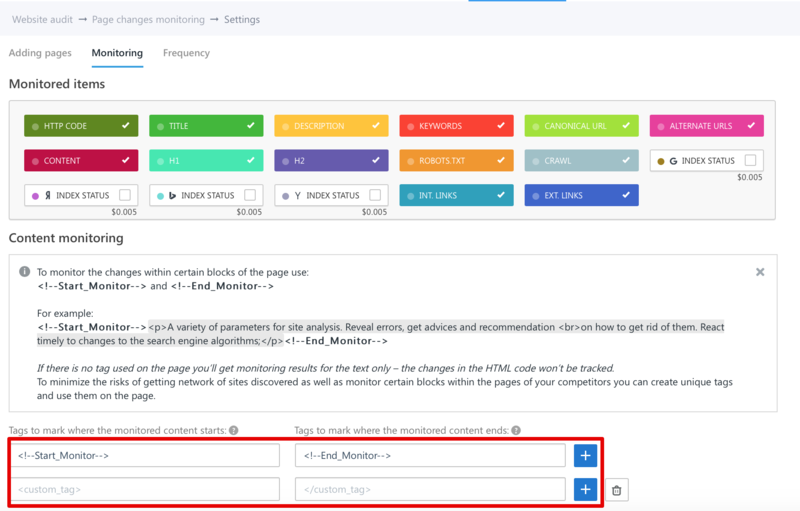 Add the pages you want to monitor. You can do it either manually or by importing xls, xlsx, csv files. Page changes monitoring scans the entire page for changes made to the key SEO-elements: Title, Description, Keywords; headlines H1-H2; content, the number of inbound and outbound links, robots.txt file; HTTP response status from the server (301, 404). Track and analyze the changes! 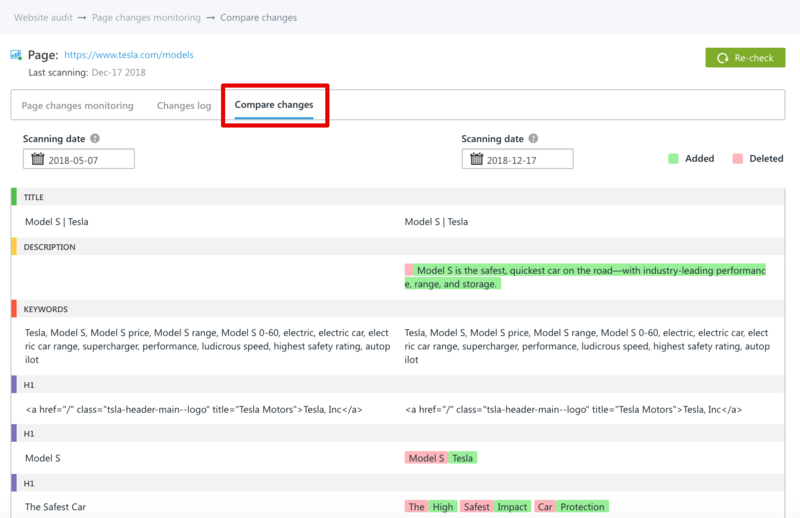 Page changes monitoring allows you to see the complete picture of the changes made to the website, and delve into the details of every change. Choose certain parts of the pages for scanning. The tool provides the following tags for that <-! Start_Monitor -> and <-! End_Monitor → – just enter them in the code of the page to select the part you want to scan. 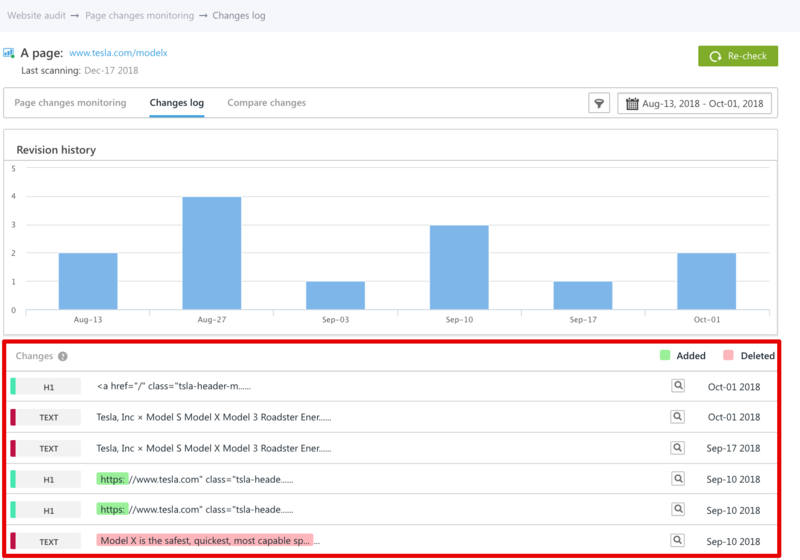 Evaluate all the changes: here you can compare the results of monitoring for the different periods of time. Red-marked content contains the areas which were deleted from the page, the green ones – newly added. Stop wasting your time on a bunch of programs and collect the results manually. Use Keyword Suggestion Tool to get a fantastic set of short tail and long tail keywords, filtered by popularity in one click! Find the section “Tools” on the dashboard and click on the Keyword Suggestion Tool. You can get keyword ideas using SE Ranking internal database. In order to start using this tool, you just need to choose “Internal database” and choose an appropriate country. Then you should enter a keyword, for example, “Android”, click “Get keyword ideas” and review the results. Hereafter, you can export in xls or csv format. Still think that PPC specialists don’t use SEO tools? Have a look at the variety and reviews of such tools on FitSmallBusiness. Let us know what you think in the comments below.